A selective and reliable method for the extraction of trace quantities of U(VI) by the use of a magnetic U(VI) ion-imprinted polymer (IIP) was developed. In this study, oleic acid (OA) coated magnetite nano-particles were incorporated into the cross-linked polymeric matrix of the selective sorbent, in order to gain the physical advantages of separating the polymers. Many physico-chemical factors influence the adsorption process; uranyl ion uptake ability based on these parameters was investigated. 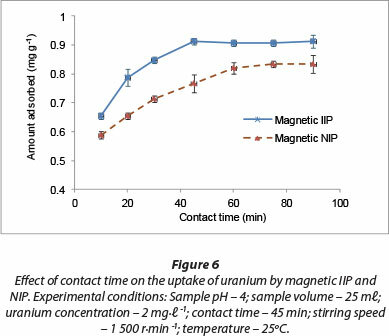 The optimum parameters obtained were sample pH 4, 50 mg of the magnetic polymer, a contact time of 45 min and an initial U(VI) concentration of 2 mg ℓ-1. The adsorption capacities for the magnetic NIP and IIP were found to be 0.95 mg-g1 and 1.21 mg-g-1, respectively. The adsorption behaviour of U(VI) in the presence of other competing metal ions onto the cross-linked magnetic polymers was also examined in binary mixtures and the order of selectivity was found to be U(VI) > Pb(VI) > Ni(II). The resulting magnetic nano-composite polymers were found to be stable up to the sixth cycle of use and reuse. The Freundlich adsorption model was used for the mathematical description of the adsorption equilibrium and the adsorption kinetic data fitted the pseudo-first-order model with R2 > 0.92. Heavy metals released into the environment show continuously increasing trends as a result of industrial activities and technological developments, and are a significant threat to the environment and public health due to their toxicity, accumulation in the food chain and persistence in nature (Peralta-Videa et al., 2009; Zamani et al., 2012). In aquatic solutions, uranium exists predominantly in its hexavalent oxidation state, e.g., UO22+ (Konstantinou et al., 2007). However, in concentrations below 10-6 mol ℓ-1, UO2(OH)+ is the dominant species in solution. Above this concentration, the study of uranyl(VI) hydrolysis is complicated due to the formation of polymeric species such as (UO2)2(OH2)2+, (UO2)3(OH)42+ and (UO2)3(OH)5+. Several methods are utilised to extract uranium from wastewaters and process effluents, which include electromem-brane extraction (Davarani et al., 2013), liquid-liquid extraction (Popov, 2012; Yang et al., 2002), solid phase extraction (Sadeghi et al., 2003) and ion exchange (Tavakoli et al., 2013). However, most of these techniques are both costly and ineffective, particularly when the concentration of uranium is very low (Blázquez et al., 2005). Removal of uranium from complex samples requires selective extraction techniques. Adsorption of uranium on sorbents is an effective and versatile method for extracting uranium. Several sorbents have been investigated which include phosphonated cross-linked polyethylenimine (Saad et al., 2012), lignocellulosic-based sorbents (Anirudhan et al., 2009). However, a common problem of most sorbents is their lack of selectivity when applied to complex matrices. This difficulty has been encountered for the selective recognition of both organic and inorganic pollutants. In order to circumvent this problem, scientists have had to come up with synthetic sorbents which mimicked biological hosts and their specific receptors based on molecular recognition. One selective method, molecular imprinting of polymers, is a concept for the synthetic formation of structurally organised materials providing binding sites with molecular selectivity (Molinelli et al., 2005). The description is very similar to the 'lock and key' analogy used to explain the action of enzymes, the molecules responsible for hastening and directing biochemical reactions (Murray et al., 1997). The selectivity of an ion-imprinted polymer (IIP) adsorbent is based on the specificity of the ligand concerning the coordination geometry, coordination number, charge and size of ions (Dakova et al., 2009). In addition to being simple and convenient to prepare, IIPs have outstanding advantages, such as predetermined selectivity, and have shown considerable promise as materials capable of ionic species recognition. Hence, IIPs are actively researched for their drug delivery capabilities (Puoci et al., 2008), catalytic applications (Abbate et al., 2011), environmental remediation (Tavengwa et al., 2013), stationary phases in chromatographic columns (Wei and Mizaikoff, 2007), solid-phase extraction (Lasáková and Jandera, 2009), and chemical and biosensor development (Piletsky et al., 2006). In the literature, a number of studies on the uptake of uranium by application of polymeric sorbents are reported (e.g. Singh et al., 2013; Singh et al., 2013; James et al., 2009; Akperov et al., 2010; Singh and Mishra, 2009). An earlier attempt was also made by our research group to extract uranium from wastewaters by application of IIP (Pakade et al., 2012). However, as the use of centrifugation and filtration in extraction of pollutants from voluminous aqueous samples was shown to be uneconomical, the current study aimed to endow the resins with magnetic particles in order to facilitate their extraction by application of external magnetic fields. A few previous studies have reported on extraction of uranium by magnetic sorbents (Wang at al., 2011; Zhou et al., 2012; Tavengwa et al., 2014). 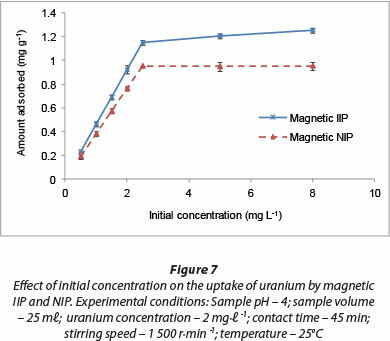 This study is focused on the synthesis of magnetic ion-imprinted polymers selective to hexavalent uranium, and the application of these to aqueous samples. Magnetic polymers were synthesised using the following chemicals: FeCl-4H2O, FeCl3-6H2O, NH4OH, methanol, ethylene glycol dimethacrylate (EGDMA), methacrylic acid (MAA), 1,1'-azobis(cyclohexanecarbonitrile), salicylaldoxime (SALO), 4-vinylpyridine (4VP), 2-methoxyethanol, oleic acid (OA), NaHCO3, all purchased from Sigma Aldrich (Steinheim, Germany). The imprint, uranyl nitrate (UO2(NO3)2-6H2O) was bought from BDH Chemical Ltd (Poole, England). Analytical grade solutions from Merck (Darmstadt, Germany) were used to prepare different buffer solutions for pH optimisation and adjustment: for pH 1 and 2, HCl/KCl was used; Na2HPO4/citric acid was used for pH 3; CH3COOH/CH3COONa was used for pH 4, 5 and 6; borax/H3BO3 was used for pH 7, 8 and 9. U(VI), Ni(II) and Pb(II) stock solutions were prepared by dissolving an appropriate amount of the salt in 1 £ of acidified deionised water with 0.05% (v/v) HNO3. Working solutions were prepared daily from the stock solutions through serial dilutions and were stored at 4°C when not in use. ICP-OES from Spectro Genesis End-on-plasma Spectro Analytical Instruments (Pty) Ltd (Johannesburg, South Africa) was used for the determination of metal concentrations in multi-elemental solutions. AAS measurements were made on a PG-990 AAS (Leicestershire, UK) with pyrolytically coated HGA-76 graphite furnace as sample tubes. A Fritsch pulveriser (Idar-Oberstein, Germany) was used to crush the synthesised bulk polymers. Deionised water was prepared from Millipore instrument (Massachusetts, USA). All pH measurements were performed on a 766 Calimatic pH meter equipped with a Shott N61 pH electrode from Knick (Berlin, Germany). In batch adsorption studies, a Laser Photo/ Contact Tachometer DT-1236L from Lutron (Taipei, Taiwan) was used to measure the rotational speeds of the magnetic stirrers. A FEI TECNAI SPIRIT (TEM-EDS) electron microscope (Eindhoven, Netherlands) was used for TEM analysis and the samples were applied to Cu grids coated with carbon film. Surface morphological information of magnetic IIPs and NIPs was obtained using a scanning electron microscope (SEM) JOEL Model JSM 6700F (Tokyo, Japan). The method of Singh and Mishra (2009) was used in the preparation of bulk polymers in the presence of OA-coated magnetite. The synthesised magnetic polymers were dried at 70°C to remove excess solvent. Finally, the magnetic polymers were washed with ethanol, then an ethanol and water mixture, with increasing amounts of water until only water was used. 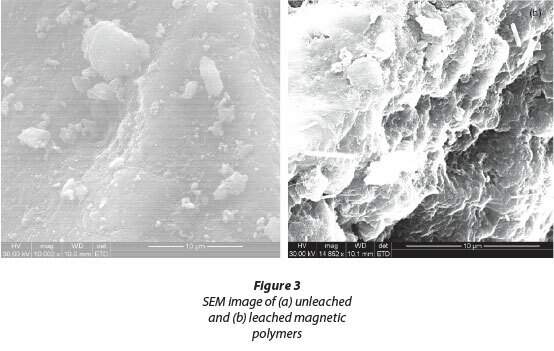 The resulting magnetic polymers were then ground and sieved to obtain magnetic IIPs in the size range of 27-53 µm. 100 mℓ of 2 mol-ℓ-1 NaHCO3 was used in the leaching of U(VI) from 3 g of the bulk magnetic polymer. The mixture was stirred gently for 6 h, after which filtration was done under vacuum and the filtrate retained for metal analysis. A freshly-prepared NaHCO3 leachant, with the same concentration and volume as above, was added to the magnetic polymers for further leaching. This procedure was repeated until uranium was nondetect-able. Magnetic NIPs were prepared and treated likewise, except that the imprint ion was not included. In batch sorption studies, magnetic IIPs were contacted with U(VI) solutions of specified concentrations (0.5-8 mg-ℓ-1) in tightly stoppered vials for a preset period of times (10-90 min) at room temperature and were stirred magnetically at 1 500 r-min-1. The extent of sorption was calculated from the amount of metal ion in solution before and after treatment with magnetic imprinted polymer. A range of magnetic polymer dosage (10-100 mg) was employed. The U(VI) ion sorption was also measured at different pH levels (2-9). For comparison, adsorption experiments under similar experimental conditions were conducted for magnetic NIPs. After sorption, the metal ion(s) content was determined using GFAAS and ICP-OES. The extent of uranium removal was given by extraction efficiency (%) and adsorption capacity q (mg-g-1) before and after uranyl binding, respectively, where V (ℓ) is the sample volume and W (g) is the weight of the magnetic polymer. The distribution ratio (K) selectivity coefficient (K) and the relative selectivity coefficient (K') were given by Eqs. (3), (4) and (5), respectively, where X is the competitor of U(VI). The synthesis of the magnetic IIP is illustrated by the scheme in Fig. 1. Firstly, the synthesis of magnetite by co-precipitation of the ferrous and ferric salts produced a black precipitate upon increasing the pH by addition of ammonia. 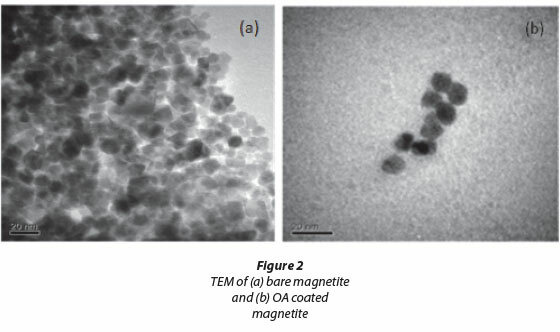 Oleic acid (OA) was then used for coating the magnetic nanoparticles. Some studies have shown that there is a strong chemical bond formed between the carboxylic acid and the amorphous iron and iron oxide nanoparticles (Zhang et al., 2006). OA-Fe3O4 was then used in bulk polymerisation where 4-vinyl pyridine (4-VP) and salicylaldoxime (SALO) had a direct interaction with the uranyl ion. The crosslinking monomer ethylene glycol methycrylate (EGDMA) was used for structural rigidity. The final stage was the washing of the uranyl ion from the magnetic polymer matrix to form magnetic IIP. Transmittance electron microscopy (TEM) analysis revealed that the mean diameter of the uncoated magnetite nanopar-ticles was 11.4 ± 2.5 nm. This diameter was consistent with that found by Lu and Forcada (2006), who obtained a mean diameter of 10 nm after synthesising their magnetite by copre-cipitation. The mean size diameter of the OA-coated magnetite increased to about be 14.6 ± 1.2 nm, illustrating that the magnetite was coated with OA. Particle size distribution of the uncoated and OA-coated magnetite showed a relatively narrow size distribution (graphs not shown). Both the bare and coated magnetite were spherically shaped. There was, however, some degree of agglomeration and clustering of nanoparticles (Fig. 2(a)). This phenomenon was reduced by coating of the magnetite with OA. Surface morphology of the magnetic imprinted particles was evaluated by scanning electron microscopy (SEM). Unleached and leached magnetic U(VI) IIP images are shown in SEM micrographs in Figs. 3(a) and 3(b). The outward appearance of the unleached U(VI) (Fig. 3a) was less porous and had a smoother surface. The SEM micrographs showed no well-defined binding sites, hence indicating its lack of suitability to act as an adsorbent. On the other hand, the SEM micrograph of the leached imprinted polymer (Fig. 3(b)) displayed numerous pores on the surface which made it a suitable sorbent because of well-defined binding sites on the imprinted polymer. A range of pH levels (1-9) was investigated to understand the dependency of uranium adsorption on this parameter (Fig. 4). In acidic environments, uranium exists predominately as a uranyl ion, UO22+. The observed lower adsorption of uranyl ions in the acidic pH range was because the H3O+ ions present in the solution competed with the UO22+ ions for complexation by the fabricated adsorption sites within the polymeric matrix of the sorbent (Zhou et al., 2012). There was a high rate of extraction of U(VI) from aqueous solution as sample pH was increased. Composite hydrolysed ionic species such as UO2(OH)+, (UO2)2(OH)22+ and (UO2)3(OH)5+ are known to form in the pH range of 4 to 7, and U(VI) also precipitates easily around neutral pHs. These phenomena occur in parallel to the sorption of the uranyl ions. Effective removal of U(VI) ions was also demonstrated in the pH range 4-6 by Anirudhan et al. (2009), who applied acrylonitrile grafted onto banana stem as an adsorbent. Adsorbent dosage is an important parameter in sorption studies. This parameter was investigated in the range of 10-100 mg and the results are presented in Fig. 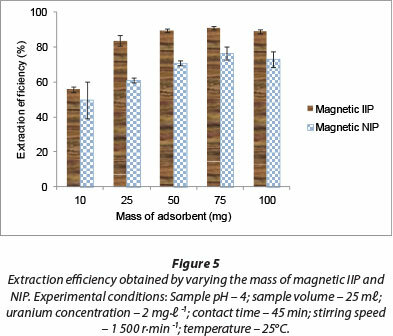 5, where it is shown that an increase in adsorbent loading increased the removal efficiency of U(VI) until the mass of the magnetic polymer material reached 50 mg. This increase in extraction efficiency could be as a result of the number of available adsorption sites. Increase in the dosage is almost linearly proportional to U(VI) adsorption in the early stages of adsorption. However, after the 50 mg dose there was no further increase in adsorption. At this stage, almost all of the metal ions may have been removed, such that any further increase in adsorbent dosage will not bring about appreciable adsorption. 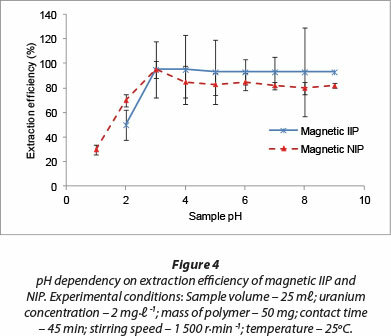 The higher extraction efficiency with magnetic IIP (> 89%) compared to magnetic NIP (> 73%) using 50 mg of polymer material can be attributed to the imprinting effect. James et al. (2009) used different weights of polymer material ranging between 20 and 100 mg in extraction of uranium from aqueous solutions. A minimum of 75 mg of IIP material was required for the quantitative removal of uranium from 25 m£ of aqueous phase. Akperov et al. (2010) observed that by increasing the sorbent weight the sorption degree of the uranyl ions also increased and reached 83.1%-85.0% at the weight of sorbent 0.125-0.15 g. The results indicate that for near-complete extraction of uranyl ions from aqueous solutions, a quantity of 125 mg sorbent is required, which was much higher than that indicated by this study. The effect of agitation time on adsorption of U(VI) ions from aqueous solutions onto magnetic IIP and NIP particles is presented in Fig. 6. High adsorption rates were observed at the beginning of the adsorption process, with most U(VI) removed after 45 min. Equilibration was gradually reached within this time of adsorption, probably due to high interaction rates and affinity of U(VI) anions for the fabricated adsorption sites within the polymer matrix. Singh et al. (2013) investigated the removal of U(VI) from aqueous solutions by polyacrylonitrile beads containing amidoximated polyacrylonitrile. Their observation was that about 120 min of equilibration time was enough for the quantitative removal of U(VI) ions. In another study, Zhou et al. (2011) found an optimum contact time of 60 min for the extraction of U(VI) from acid-leaching uranium-containing wastewater by 68% modified carboxy methyl cellulose polymer. Much longer extraction periods have also been reported in the literature. For instance, Anirudhan et al. (2009) applied grafted acrylonitrile onto banana stem and an equilibrium time of 180 min was recorded. Uranium adsorption is significantly influenced by the initial concentration of U(VI) ions in aqueous solutions. In the present study, the initial U(VI) concentration was varied from 0.5-8 mg-ℓ-1 while maintaining the adsorbent dosage at 2 g-ℓ-1. Figure 7 shows the effect of initial concentration on the extraction efficiency of U(VI) ions. The removal capacity of U(VI) ions increased with an increase in initial U(VI) ion concentration from about 0.2 mg-g-1 for 0.5 mg-ℓ-1 to 0.95 mg-g-1 and 1.21 mg-g-1 for the magnetic NIP and IIP, respectively, at a uranyl concentration of 2.2 mg-ℓ-1. This might be due to an increase in the number of U(VI) ions for the fixed amount of adsorbent. Polyacrylonitrile beads, containing the ami-doximated polyacrylonitrile, were prepared for adsorption of uranium by Singh et al. (2013) and the uranium uptake capacity of the polymeric beads were found to be 3.5 mg-g-1 for the swollen beads. The quantitative extraction of uranyl ions was obtained at optimum conditions. It was observed that in both cases of U(VI)/Pb(II) and U(VI)/Ni(II) binary solutions, the U(VI) was preferentially adsorbed with an average extraction efficiency of 84.3%. However, the competitor ions, Pb(II) and Ni(II) were weakly co-extracted at an extraction efficiency of 62.8% and 55%, respectively. From Table 1, it is observed that the selectivity coefficients of magnetic IIPs were higher than those of the corresponding NIPs. The functional monomers immobilised within the polymer matrix of the host magnetic IIPs had strict configurations suitable for the guest uranyl ions. Furthermore, the ionic recognition was also influenced by the nature of metal ion, its ionic radius and charge. The overall order of ion adsorption onto magnetic polymers, based on relative selectivity values, was: U(VI) > Pb(II) > Ni(II). To test their stability, magnetic polymers were subjected to several loading and leaching operations. The loading operations were carried out by saturating 50 mg of polymer with 2 mg-ℓ-1 of uranium(VI) in 25 mℓ of deionised water. The leaching operations were carried out by shaking the magnetic polymer with 25 mℓ of 1 mol-ℓ-1 HCl. The results from both tests agreed (within 2-3% error) for up to 6 cycles of repeated experiments. A comparison of the prepared magnetic IIP with some of the literature values for different polymeric sorbents is presented in Table 2. It can be deduced that the performance of various sorbents and loading capacities varies widely. This situation is because of the larger surface area of some natural polymers which is a direct result of the type and strength of leaching solvents used. The type and amount of cross-linker also have a direct effect on the performance of the polymer. Variation in optimum pH is as a result of the functional monomers used.Generally, embedding solid cores in polymeric matrices results in shallow pores which means that fast kinetics and low adsorption capacities result. This is supported by the findings in this work. There are, however, other magnetic sorbents which have been proven to have high adsorption capacities for uranium, such as the one synthesised by Zhou et al. (2013). Kinetic modelling is important in order to gain insight into the mechanisms and rate-controlling steps affecting the kinetics of adsorption. Adsorption data can be modelled using the Elovich equation, intraparticle diffusion Weber-Morris kinetic model, the film diffusion model according to the Reichenberg equation, the film diffusion model according to Vermeulen's approximation, pseudo-first order or pseudo-second order models. The last two are the most widely used models for the adsorption of a solute from aqueous solution and were the ones used in this research. The pseudo-first-order kinetic model is given by Eq. (6), where qt (mg-g-1) is the amount of metal ion adsorbed onto the magnetic polymer at time t (min), qe (mg-g-1) the amount adsorbed at equilibrium and k1 (min4) is the rate constant of first-order adsorption. After integration between boundary conditions t = 0 to t and qt = 0 to qe, Eq. (6) gives Eq. (7). Pseudo-second order model is applied when the applicability of the first-order kinetics becomes unattainable and is based on the sorption capacity of the solid phase. The mathematical representation of pseudo second-order is given by Eq. (8), where k2 is the rate constant of the second-order model. For boundary conditions t = 0 to t and qt = 0 to qe, Eq. (8) becomes Eq. (9). The plot of t/qt versus t should give a straight line if the pseudo-second-order kinetic model is applicable and qe and k2 can be determined from the slope and intercept of the plot, respectively. Table 3 shows a comparison of these two models and reveals that the pseudo-first-order kinetics modelled the data better than pseudo-second-order kinetics by virtue of having higher correlation coefficients, R2 > 0.92. The implication of this is that the sorption of the uranyl ions onto the magnetic polymers occurred via a chemisorption process. Equilibrium relationships of how adsorbates interact with the adsorbent materials are generally described by adsorption isotherms. These adsorption isotherms are important for optimisation of the adsorption mechanism pathways, and expression of the surface properties and capacities of adsorbents (El-Khaiary, 2008; Thompson et al., 2001). There are many adsorption isotherms, which include Langmuir, Freundlich, Dubinin-Radushkevich, Temkin and BET, but the first two still remain the two most commonly used isotherm equations (Kinniburgh, 1986). The applicability of the isotherm equations is judged by the value of their correlation coefficients (R2) and is also used in order to understand the extent and degree of favourability of adsorption (Treyball, 1980). A plot of lnqe versus lnCe gives a linear graph where coefficients Kf and n can be calculated from the intercept and slope, respectively; 1/n is an indicator of adsorption effectiveness. The Freundlich coefficient, n, should have values in the range of 0 < n < 1 for a favourable adsorption reaction. A plot of 1/qe versus 1/Ce gives a straight line and the constants qm and b are obtained from the intercept and gradient, respectively. From Table 4, it can be concluded that the data were better modelled by the Freundlich isotherm. This result demonstrates adsorption of the uranyl ions onto heterogeneous binding sites within the magnetic polymeric matrix. It also assumes that the adsorption capacity of the adsorbent increases with increasing concentration of the U(VI) ions, which was the case observed with the effect of U(VI) concentration. 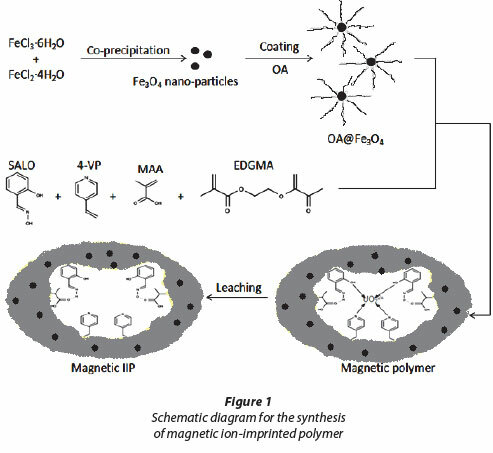 Ion imprinting improved the capacity of U(VI) ion adsorption onto magnetic polymers. The optimum conditions for U(VI) adsorption for sample pH, amount of sorbent, contact time, initial U(VI) concentration were 4, 50 mg, 45 min and 2 mg-ℓ, respectively. The magnetic U(VI) ion-imprinted polymer exhibited preferential extraction and preconcentration of U(VI) ions from aqueous solution ahead of competitors. This work was funded by the Water Research Commission of South Africa which the authors would like to express their appreciation for. We also would like to thank the University of the Witwatersrand Post Graduate Merit award for the tuition fees paid for most of the tenure of the research period for Mr Nikita Tawanda Tavengwa.